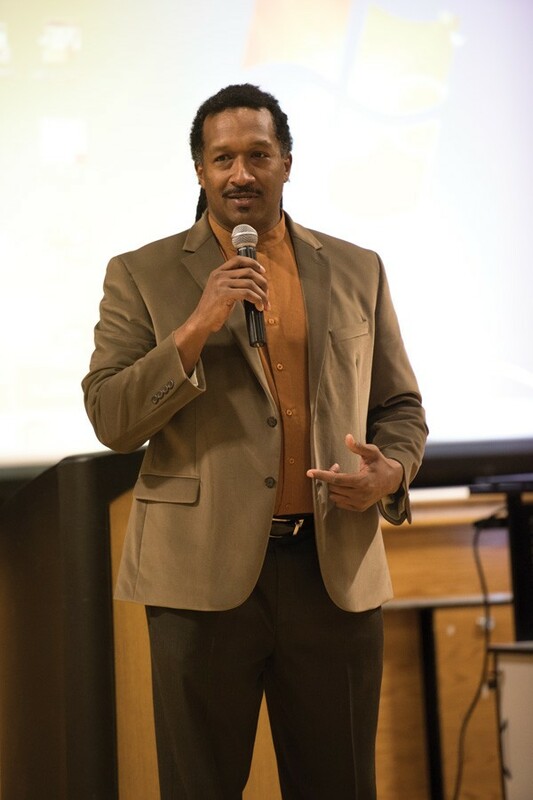 Dr. Gilo Kwesi Logan leads a discussion about diversity and inclusion efforts from the Evanston Police Department at the Levy Center, 300 Dodge Ave., on Tuesday night. More than 50 residents, officers and city officials attended the event. Evanston residents, police officers and city officials gathered Tuesday evening at a town-hall style event to discuss how the Evanston Police Department can improve in areas of diversity, inclusion and community engagement. The talk, titled “An Evening of Diversity Dialogue,” was held at the Levy Senior Center, 300 Dodge Ave., with more than 50 people in attendance. Residents filled out surveys and questionnaires during the event which probed their perception of EPD. Dr. Gilo Kwesi Logan, a diversity consultant, facilitated the discussion. EPD hired Logan, president of Logan Consulting, LLC, to lead the department’s diversity and inclusion training starting in September 2015. Logan, a writer, educator and speaker with more than 20 years of diversity consulting experience, said he would collect the data from the submitted surveys, questionnaires and discussions to help further develop his training plan for EPD. Mayor Elizabeth Tisdahl and Evanston Police Chief Richard Eddington spoke at the beginning of the event on the importance of the diversity discussion. Logan went over his background as a fifth-generation Evanston resident and emphasized that he is a spokesman for neither EPD nor residents. However, he said as a 5th Ward resident, he is able to incorporate his experience and understanding of what it is like to be an Evanston local into his work. Logan said he has already conducted 42 hours of focus group work involving residents, police officers, city officials and staff, and he said these groups have provided feedback on what the department needs to work on. He added that he is in the process of designing diversity and inclusion training for EPD based on these focus groups and Wednesday’s event. Beginning this spring, Logan will conduct approximately 10 to 18 training sessions that will involve every sworn EPD officer, with each officer receiving eight hours of diversity and inclusion training. After Logan spoke, residents, grouped together by the ward they lived in, discussed their perceptions, concerns and recommendations of and for EPD. Evanston police Cmdr. Diane Davis told The Daily although Tuesday’s discussion would be the only town-hall style event held, the process of receiving community feedback is ongoing, as well as the diversity training. “The reason we’re doing this town hall is so we can get input from the community, and that will help us tailor our training as we go forward,” Davis said. Residents in each group presented the results of their 45-minute group discussions to all in attendance, and five main points came up in all groups, Davis told the crowd after the discussions. She said all groups expressed concern with biased policing and said they have a sense of overall mistrust from EPD officers and would like to see all officers reside in Evanston. Additionally, she said all groups said they would like the formation of a civilian-police board, and that EPD should address mental health issues. Bill Green (Law ‘74), who attended the discussion, volunteers on the Evanston Housing and Homelessness Commission and the Evanston Commission on Aging. He told The Daily he thought some people who spoke during the event only voiced complaints about EPD rather than suggestions. However, Logan told the audience he was grateful for residents’ participation and involvement in the discussion.